Laying sod is relatively expensive - around $3.50 per square yard, plus labor - so it behooves a homeowner to measure carefully and use a little as possible. In addition, properly measured sod shows less in the way of joints and results in a better looking lawn, at least at the very beginning. The first step is to test the soil. You can get a kit to test your soil yourself or ask a lawn care professional you trust to help you. They will tell you everything you need to know. Then, add a rich nutrient base that will leave the soil slightly acidic - a pH between 6 and 7.5 is best. 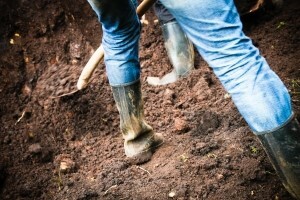 Rough tilling of the soil to a depth of two inches is crucial as it allows the roots of the sod to easily penetrate the soil. It takes some time and work but this step is well worth the effort. Next, thoroughly wet the area and apply "starter" fertilizer that is high in phosphate. Take the time to work this material into the soil to avoid root burn. Start by installing along the longest straight line you can find - either your driveway or the curb along the front of your yard. Then stagger the next row so that the joints do not line up. Take your time to lay the pieces of sod firmly against each other without leaving gaps or causing overlaps. Finally, roll the entire lawn one time to improve the contact between the sod and the ground underneath. Dry, hot climates like those here in Southern Arizona will quickly evaporate the moisture in sod before it becomes properly established. This fact means that you will have to water at least once a day - preferably in the evening so the roots of the sod have a chance to absorb as much water as possible. Most homeowners want perfectly manicured lawns right out of the box but, with a new sod lawn, you will have to live with a little untidiness for three weeks to one month. Definitely do not mow it and try to stay off of it as much as possible. You will eventually be rewarded.